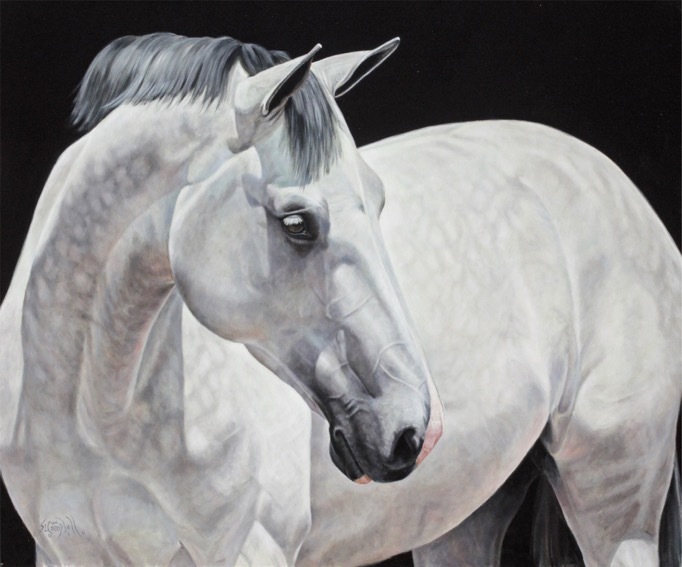 One glimpse of the horses, family pets and people painted by Sharon Lynn Campbell is all it takes to understand why she’s renowned as one of today’s leading portrait artists. She established her reputation by painting what she knows best: hunters and jumpers. Her preference for huge canvases — her paintings are often life-sized and always lifelike with exquisitely rendered detail — began in 1999 with her first commission: a 36 x 48 inch oil painting of a foxhunting scene. Her reputation grew by leaps and bounds, alongside her evolving skills and technical mastery, and she still prefers to paint really big. 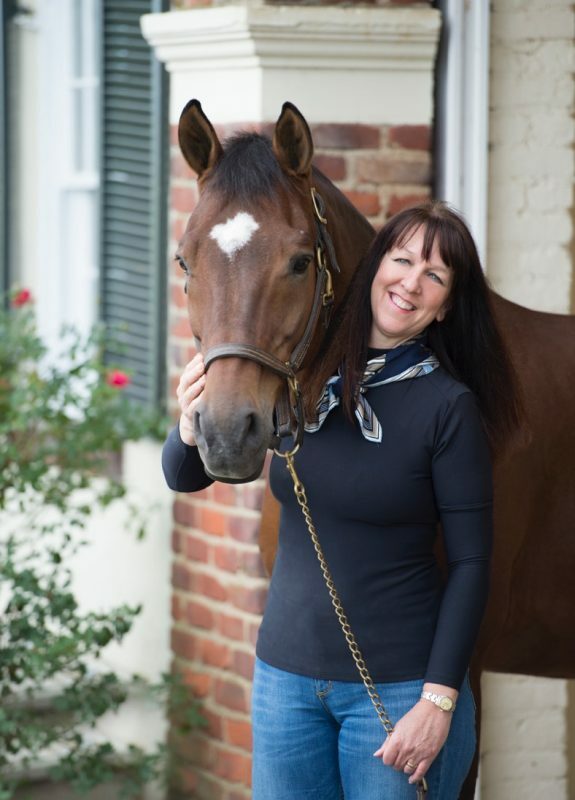 Sharon’s work has adorned the covers of major horse show programs, including Capital Challenge, Middleburg Classic, Washington International, USEF Pony Finals, Upperville, the Winter Equestrian Festival and publications such as The Chronicle of the Horse. 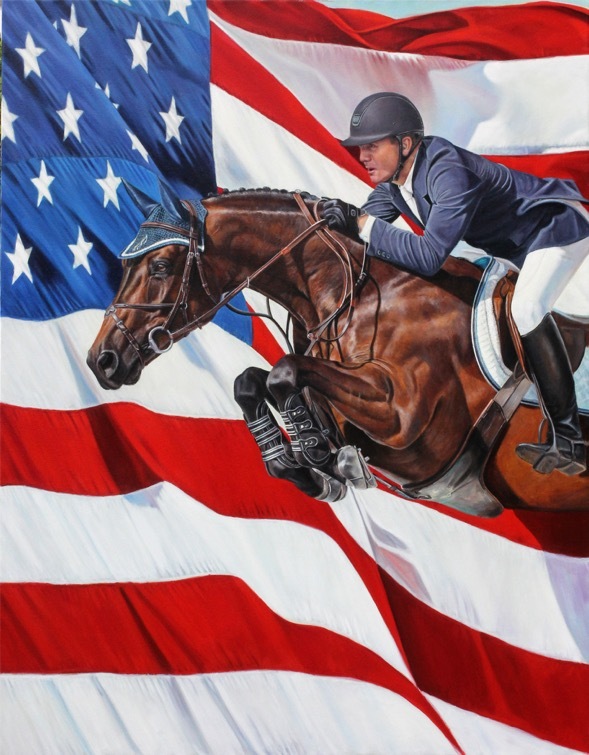 In 2012, Sharon donated a life-sized custom oil portrait to the U.S. Equestrian Team Foundation’s gala fundraiser for our Olympic and Paralympic equestrians going to London that year. This year, she contributed another signature custom oil portrait to the USET Foundation’s Rockin’ Rio fundraiser. Sharon’s art opened the live auction and the gavel fell at $22,000 — both times. Sharon rode until they divorced in 1992. She had three children to support, no real job skills, and a house in Madison, Virginia. She felt desolate, being so far from her family. Her father advised her to look for a job in sales as she was good at selling horses. 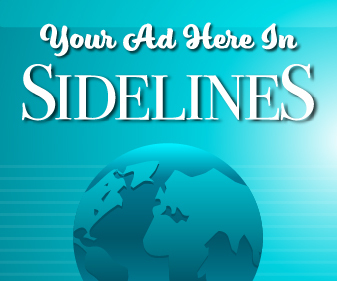 For about 3 1/2 years, she sold ads for the Yellow Pages, but craved more fulfilling work. 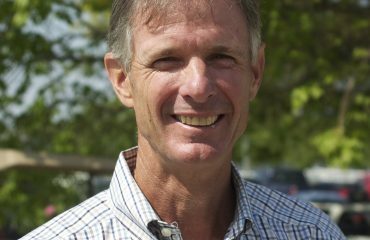 In December 1997, she met George Campbell at church and they married in June 1999. That September, inspired by faith and encouraged by George, she began painting. 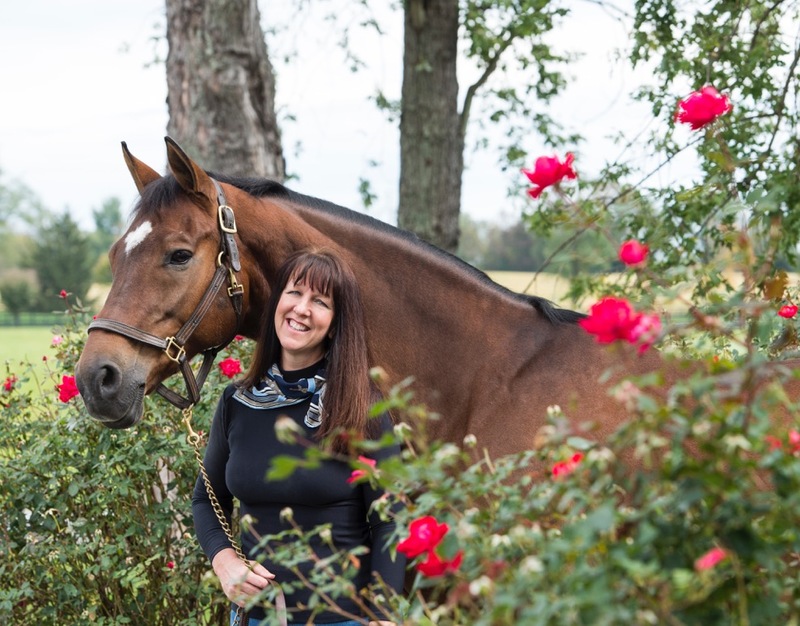 When it comes to detail, Sharon has mastered every nuance from the highlights on a horse’s coat to facial expression, eyes, ears, braids, shine on bits, nail holes in hooves, tack and appointments. Her action paintings almost explode out of the frame. Hunters and jumpers might be posed with rider or in the air with smartly snapped knees, festooned with rosettes or tri-colors during awards or gazing over a stall’s half-door. Siblings or adults might pose with beloved pets. Formal or candid, whatever the setting, Sharon “gets” her subjects and also portrays them brilliantly. 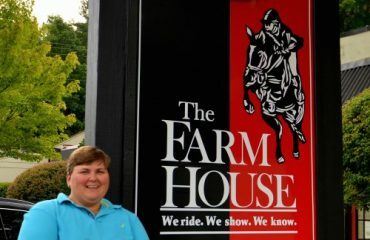 Sharon at Huntland, owned by Dr. Betsee Parker. 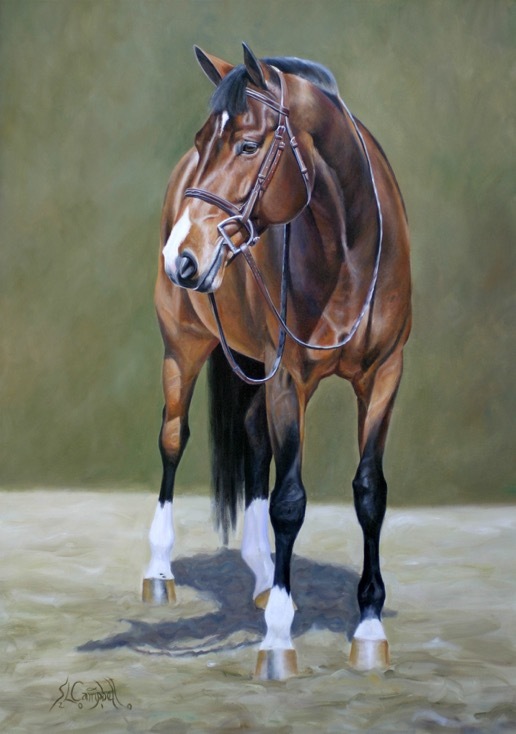 Sharon painted a portrait of the famous junior hunter Ovation, owned by Betsee. Sharon has six to 10 paintings in the works at any given time. Grey horses, especially older ones whose coats are mostly white, take especially long to dry between layers. The average timeline to deliver a portrait is 10 to 12 months. Sharon’s the first to admit she’s come a long way since those years between horses and art. Her children are grown. She has two grandchildren. 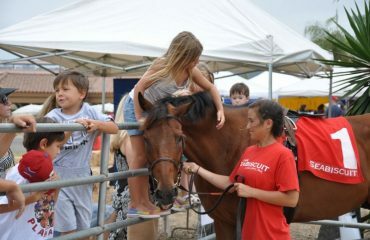 Her father passed, but her mother, who took Sharon and her sister to shows and ran the barn, is a proud great-grandmother.